Based on the SPG series, SPG c adds a newly-developed zoom button which aims to move mobile photography into a new world. With the mature anti-shake system, SPG c can effectively reduce the negative effects from the shaking of human body. Whether vertical or horizontal shooting, SPG c can satisfy all you need. It is widely available to show more shooting ideas and capture the wonderful life. Industrial design offers the hardware support the manual mode of Feiyu ON APP, under the combination of the up and down movement of joystick and the zoom button, SPG c can achieve the real time setting of focal length in the process of shooting. Has one power-intense ICR 22650 battery which offers 7 hours stable work duration for your long time outdoor work. Also available for you to have real-time charging by using power bank. 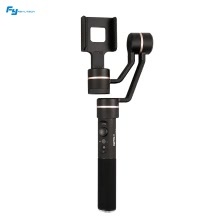 When Feiyu ON locked the face in the shooting image, the gimbal can achieve face tracking, following the direction of person&apos;s movement automatically. Record every wonderful selfie moment, one button works. The time-lapse photography function can be achieved by setting Feiyu ON APP. Under the panorama mode, click the shutter button and combine the direction of the joystick, a panorama picture is successfully captured. Through remote restoration, you can check the pictures and it will match them up one by one automatically. Other functions: Parameter setting in APP. Can implement fast locking, zoom-in and zoom-out of lens and panning resetting, etc. Suitability: For 50mm-80mm width smartphones, such as for iPhone series, for HUAWEI P10/P9 and P10 Plus P9 Plus, for Mi 6/5 for MEIZU MX6, for Samsung Note5/S7 or other ones with similar dimensions. Smartphone and power bank are not included. Please make sure the battery is fully charged before you use the gimbal for the first time. Please install a smartphone before turn on the gimbal. Turn off the gimbal and remove your smartphone when they are not in use. Read user manual to master its installation, charging, balance adjustment, working modes and firmware upgrade.